The 14th week of the 2014 NFL football season kicks off on Thursday, December 4th, 2014 with the Dallas Cowboys traveling to take on the Chicago Bears. The Sunday day games see a number of quality matchups to include AFC North rivals Pittsburgh and Cincinnati playing their second matchup of the season in Ohio, Carolina playing at New Orleans, and Indy playing at the Cleveland Browns. Sunday Night Football has the New England Patriots traveling to the west coast to take on the San Diego Chargers. 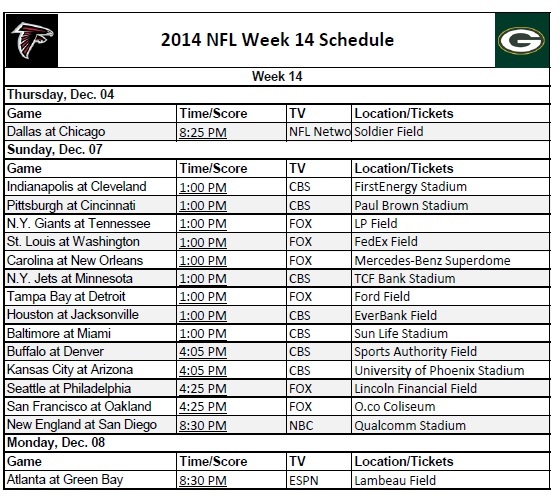 The Monday Night football game has the Atlanta Hawks traveling to Lambeau Field to take on the Green Bay Packers. The 2014-15 NFL season is finally here. Here’s is the NFL season schedule for 2014-15 in both printable and HTML formats for you to view, download, and print out if you so choose for the NFL week 14 schedule. We provide you with a printable NFL schedule in a printer friendly, PDF version.